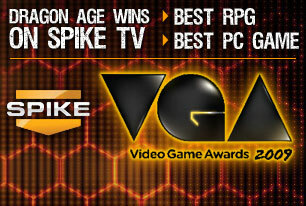 Dragon Age: Origins wins both RPG Game of the Year and PC Game of the Year at Spike TV’s Video Game Awards! On Saturday night, Dragon Age: Origins took home 2 incredible awards at this years Video Game Awards on Spike TV winning both RPG Game of the Year and PC Game of the Year. Dragon Age’s Executive Producer Mark Darrah, BioWare co-founder Greg Zeschuck and other members of the Dragon Age developement team were on hand at the awards show and Mark Darrah winded up being the man to go on stage and claim the 2 trophies from the presenter rapper Snoop Dogg. We want to take a moment to thanks all of our great Dragon Age: Origins fans who voted for us. Winning awards is always excellent, but when it is the fans who buy, play and enjoy our games, it makes the awards even sweeter. Thanks to everyone who voted for us.